A mug of steaming coffee and a book in hand makes for a perfect winter day. The cover instantly gives the feel of that perfect winter day. Often, such quiet times spent with self rings in nostalgia and we end up reflecting on the times gone by. I decided to treat myself to a hot cuppa and explore what the book had to offer. True to the cover, the book indeed is all about memories and nostalgia. It is the story, rather memoir of Richa. Often, we sit back and reflect on the good and bad times gone by, analysing what we did and what could have been done. More often than not, the refection is about the relationships in our lives. 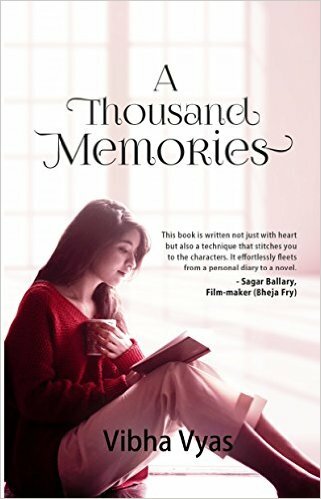 A Thousand Memories is one such memoir where Richa looks back at the men in her life. She recollects how with each relationship, her heart graduates to understand the meaning of true love, before finding the right man. Perhaps "Diary" would be a better description, for reading the book one gets a feeling as if reading Richa's diary. Like any girl of her age, for Richa too her first experience in love is of a one sided crush on Roy. Although the madness inside her goes beyond a simple crush, it also gives her some very important lessons in life. If you've ever had a crush, reading this segment will indeed make you smile with nostalgia. Before Richa's wounds are healed, The Mr. Perfect Rajiv enters her life. A life with Rajiv sounds like a dream come true, however the past haunts Richa enough to shadow her present. Richa eventually does find true love, but not without her share of struggles with her inner self and painful moments. Grab this book for an honest narration, sans any frills or drama. For most readers, this diary will surely ring in some their own memories. No unwanted gloss to add tadka to the book. The emotions and events are presented unedited. Beautiful anecdotes to suit the situation. Not all fiction lover will find this book his/her cup of tea. True to being a diary, the story runs flat and straight, sans any drama and struggles to hold interest of the reader. This review is for Amaranthus Books. Having read Vikrant's last book Love Last Forever, I picked up this book expecting a romantic story. However, the lady looking in the mirror hinted at something mysterious. Since I avoid reading the back cover blurb, the mere mention of "What if you could read the mind of the person you love?" got me enthusiastic and curious. After all, who wouldn't want to read the mind of his/her love ;) Of course, little did I know it's much complicated than it appears. Sometimes, it takes one event to rephrase the story of our life. For Sahil, it was the death of his mother at the time of the birth and subsequently, his father's suicide. Though technically, he was not to be blamed for their deaths, yet the people around him ensured he carried the burden of guilt throughout his life. His grandmother left no occasion to rub in the guilt. The helplessness, agony, irritation and sadness transformed Sahil into a rebel. He found solace in music, writing and often vented out his anger in the form of self inflicted injuries. Little did Sahil know that another turning point awaited his boring life. Love blesses his life in the form of young and beautiful Tanya. Smitten by her beauty and personality, Sahil soon opens up his life to her over coffee dates and Tanya becomes his friend, philosopher and guide. However, the series of events that followed next shouted at something beyond the pretty face. The gruesome murders in Simla by serial killer, the tension in the air, the arrival of Tanya's mysterious friends began to concern Sahil. Like a knot, the more he tried to solve the mystery, the more complex it seemed. The more he tried to find about the sad bone in Tanya's life, the more she seemed to slip out of his reach. Still, he couldn't deny the fact that Tanya brought balance and positivity to his life. She was the "know it all" types who would often counsel Sahil about having a positive outlook towards life. Indeed Sahil was destiny's chosen child. As if the stress wasn't enough to handle, the accident further shattered his life. But life, like a true roller coaster ride throws a surprise. When Sahil rises from coma, he discovered he could now read people's minds! And the reader in me marvelled at the liberty fiction writers take! Seems Vikrant wanted to throw some more surprises at the readers. So, in come the revenants or "people back from the dead" and the story takes its flight of supernatural! while many readers lost interest at this point, I actually got hooked on to the story. Vikrant impresses us by steering away from the cliched romantic stories and instead experiments with thrill, crime and supernatural. What really kept me hooked on at this point was the seamless shifting of gears to supernatural. 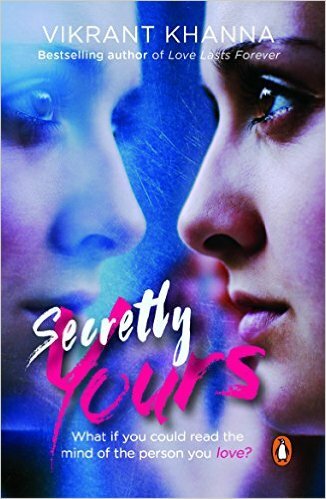 Whether Sahil and Anya's love finally saw a happy ending, or whether the cycle of murders finally ceased is for the readers to read and find. But, the story here makes one ponder about karma and the true purpose of life. The same Sahil, who took his life as a punishment, learnt to count his blessings and cherish the beauty of life and relationships. The book also gives a very strong message against suicide. When I finished reading the last page, I really loved the fact that the book ends up going beyond just a story. It gives a positive message about looking at the glass half full, and not cribbing about the empty half. • What matters is not the years in life, but the perspective towards life and the book beautifully conveys this message. It makes one think about Karma and the purpose of our life. • Amazing combination of romance, emotions, drama, supernatural, thrill and crime in one story. "Love isn't a decision, love isn't even a choice and love certainly can't be based on conditions. It's a breathing, living being that seeps into our lives, spreads and gradually takes full control of it. It brings immense joy and sorrow in equal measure, but once infected by it, we can never be the same again." "Apologies have an expiry date. If you wait long they lose their magic." Vikrant Khanna is a captain in the merchant navy. He is the bestselling author of When Life Tricked Me and Love Lasts Forever. Apart from writing, he is fond of composing songs and playing the guitar. He lives in New Delhi.